. : Lunar Palace v.5 - Japanese: Sailor Mercury :. Ami's IQ is 300. She live with her mother, who is a doctor at the Tenth Secondary General Hospital, in a mansion (apartment) in Minato-ku. 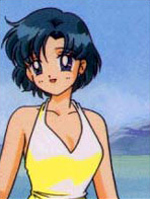 Because of Ami's good marks she was resented by other students. Ami was thinking about studding abroad in Germany so that she could become a doctor. The Super Computer shows how to defeat and track enemies. The computer is connected to the monitor inside Mercury's goggles and it help her predict the enemies actions. This transformation is from "Ami's First Love: Pretty Soldier Sailor Moon SuperS Plus"
This attack is from "Ami's First Love: Pretty Soldier Sailor Moon SuperS Plus"